I don’t usually pick up the latest sensation in books, but I couldn’t resist Go Set a Watchman, the new manuscript from Harper Lee. Especially after The New York Times ran a good half-dozen articles about it! I love To Kill a Mockingbird (though I admit it’s been several years since I read it) and after all the hoopla and mystery around this one, I was pretty curious. And in the end…I have to highly recommend To Kill a Mockingbird. 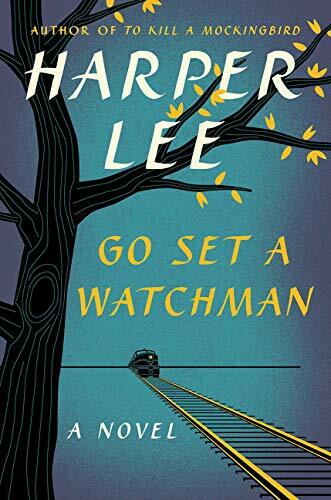 Go Set a Watchman tells the story of Jean-Louise Finch, twenty-six and visiting her hometown of Maycomb, Alabama after living in New York. In between childhood reminiscences, she discovers a disturbing trend towards racism in her childhood friend and boyfriend Hank (also called Henry), and even more alarmingly, in her sainted father Atticus. That’s a really bad plot description—but to be honest, it’s not much of a plot. For a good quarter of the book I had no idea where this was going (I mean, apart from what I’d read in those NY Times articles), and once it gets into the meat of things, it’s largely Jean-Louise freaking out…only to never really come to a meaningful resolution on the primary issues. The story-behind-the-story seems to be that Harper Lee sent Go Set a Watchman to her editor, who told her the childhood flashbacks were really interesting and to write from that perspective. And she was so right. Those were my favorite parts, especially the earliest-chronological one, which would be contemporaneous with To Kill a Mockingbird (favorite single moment? Dill wearing a sheet to be the Holy Ghost). The grown-up portions…I had a lot of trouble trying to get a grasp on the characters (including Henry/Hank, who was called by both names for no reason apparent to me), and how exactly Jean-Louise felt about them. And there were quite a few portions when people got into philosophy and political diatribes, and I honestly wasn’t sure if Lee was being profound…or just obscure. And one serious, fundamental problem—by the end of the book I’m honestly not sure how racist Atticus is. That’s what everyone seems to be freaking out about with this book, and I really don’t think it did a good job portraying that aspect of Atticus…even though it seems to be the primary conflict of the book. Definitely Atticus makes some disturbing comments, but there’s a lot of range between a full-on bigot and a man who is a product of his time but liberal for his context, and engaging with the full-on bigots in the interest of changing the system from within. And I don’t know where he is in that range. Spoilers here, because I want to talk about the ending! One reason I can’t figure out Atticus’ views is because the book takes a sudden right turn in the last few chapters. Just when it seems heading towards some kind of climax/resolution around the racism issues, it suddenly turns into Jean-Louise’s uncle explaining how the real problem here is that Jean-Louise hero-worshipped her father and now she sees his flaws and that’s so much better so everything is good. And oh, how I am bothered by the wise old man patting the hysterical woman on the head (actually, slapping her one, literally) and explaining the world to her. So besides the issues I have with that, we also never get a resolution on the racism issue. So, at the end of the day, it’s easy to look at the book and say it needed a rewrite when I know the editor told Lee that fifty-odd years ago…but I think it’s true. This isn’t a rough draft, it’s complete and it has some good things in it…but it needed a rewrite. And luckily for all of us, that rewrite turned out to be To Kill a Mockingbird, which I found to be a far, far better book. Other reviews…are pretty endless for this one! I read it, too, and concur with your view. This book could never live up to her masterpiece. The ending was, to say the least, unsatisfying. I really wondered, besides how Jean Louise would deal in the future with her father and Hank/Henry (Would she marry him or not? That seemed unclear to me), how she would live day-to-day in Maycomb with her stifling women “friends,” given her differing views from theirs on practically every subject. It’s clear this was a first draft of a novel that, when re-worked extensively, went on to become the classic we love. This story seems very unfinished, which I guess it was!